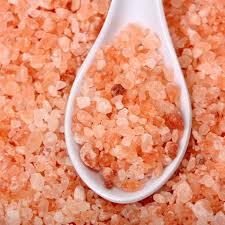 Heavenly Himalayan Rock Salt. October 19 2015. I told you all I would post a bit of information about this new salt that has taken the country by storm in the past year. I found it in my local butcher’s and because we love all things pink in this house I threw it into the shopping without much thought. When I started banting suddenly Pink salt was everywhere. Basically Himalayan Pink Salt is considered the most natural salt in the world – it is mined in Pakistan and has 84 minerals contained in its crystals. Not just a pretty face then! I started using it while banting because it is claimed that the magnesium contained in it can prevent sugar cravings. It is also good for muscle cramps, and the reality is that when you stop eating processed foods your salt intake naturally plummets. I love salt – always did so you can imagine how happy I am about the whole salt business! I find the antihistamine one fascinating – my husband is a sufferer – and in eight weeks he hasn’t had any issues. If you google the subject you will find as many negative comments as positive ones disclaiming all the health benefitsof this particular salt. The fact that the crystals are much larger when ground than the more refined table salt means that you in fact eat less of it than regular salt – a plus of course. All I can tell you is that we love this salt in our house – my children use it every day and because there’s no salt in anything we are eating we have a new appreciation for the flavour of our food. The pink salt only enhances this. I’ll shoot off a quick post about hotel living and surviving on a banting diet next. Well done on your blog! I’m going to invest in some Himalayin Rock Salt today. Thanks Anne! It’s lovely stuff! Next PostNext A night away doesn’t have to scare you anymore. 19 October 2015.